I was lucky enough to be able to have a guest post over at Alderberry Hill a couple of weeks ago! I’m just starting to get my feet wet with jewelry making, but I’ve always loved charms and beads. When I was a little girl, my mother had this beautiful silver charm bracelet that she got on her sixteenth birthday, and I loved to take it out of her jewelry box and admire it. I always wanted one just like hers, but never had one. However, this summer is my chance! I made my own charm bracelet! As you probably know from my other Swim League Swap posts, swimming is big in the months of May and June around here. Frog is a swimmer, and not being much of an athlete, I am a big sports mom! I love being able to get out there and cheer for him. Watching your child compete is a thrill of excitement and fear unlike anything else I’ve ever experienced. I wanted to make some cool swag that I could wear to show my support of Frog’s swimming prowess, so I made a Swim Team Fan Charm Bracelet for myself! 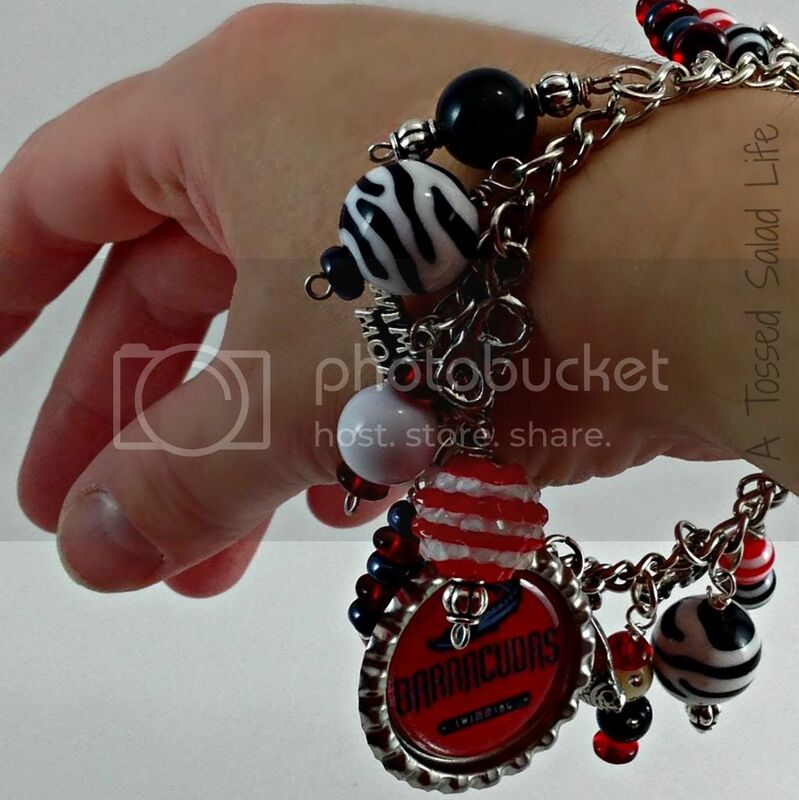 This project can be personalized and tailored to any sport, just change up the team colors, and charms you use. I made this project to complement Frog’s Swim Bag Tag using the leftover beads and charms. I want to emphasize that I am a complete newbie when it comes to making jewelry, but I got a lot of help from wonderful tutorials at One Artsy Mama on wire twisting. Beads: A variety of acrylic beads in your team’s colors. Mine were all 8mm to 14mm in size. 2″-3″ Head Pins: You’ll need to put them on head pins to string the beads onto wire. Flattened bottle cap: I bough a bunch that had jump rings already attached to them. However, if you can also use a metal punch tool to attach your own jump ring. Jump Rings: These attach your beads to the charm bracelet. Link of Chain and Clasp: I actually found a seller on etsy that gave wrist links of chain with the lobster clasp already attached. This was great for the novice jewelry designer. The first part of the project involves stringing the beads onto the head pins in designs that you find pleasing. This part is a lot of fun. You’ll need to use your round-nosed pliers to twist the wire around to create a wire loop. I am very much a novice at this, and you’ll notice below that even with tougher gauge wire, I was able to make round loops with the round loop pliers. I didn’t have a lot of success getting careful photos of this process, but I found a wonderful video that guided me through the loop making. I did hover want to make sure that my beads didn’t fall off, so I twisted my wire around the base of the loop. This means that you will need to attach the beads to the chin with a jump ring. After twisting and attaching beads, you’ll end up with an assortment of bead combinations. like you see below. At this point, you are ready to attach your beads to the chain with the jump rings. You can also attach the charms to the chain. I gathered together about 6 swim related charms. 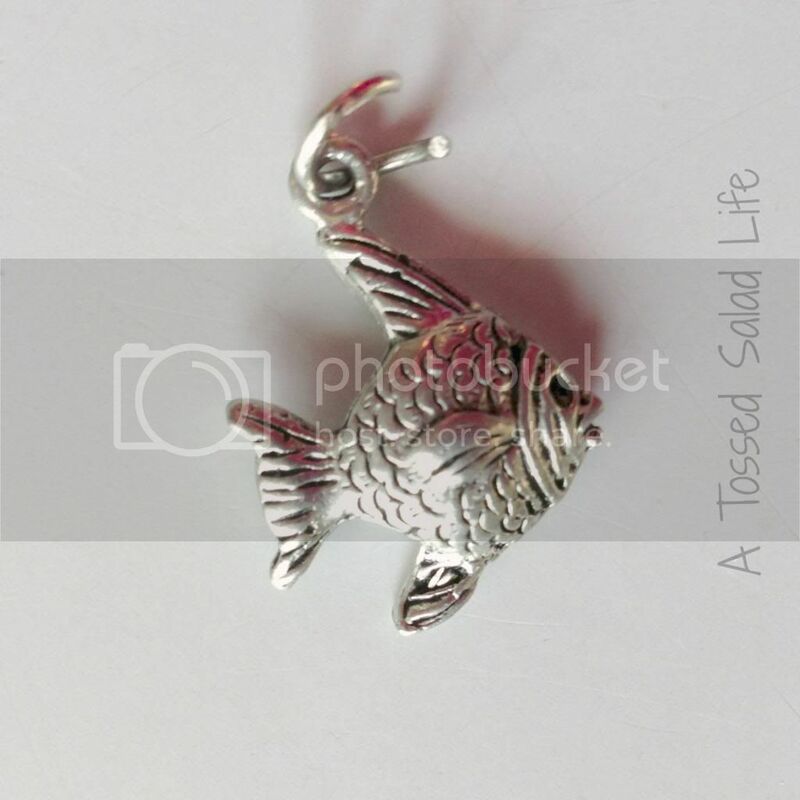 I found online silver googles, a swimmer on a diving block, “Swimmer Mom”, a fish (the team mascot), a sun and a “We’re #1” charm. I know that Etsy has a variety of charms for football, basketball, baseball, golf and hockey– in fact, there are a lot more for those sports than there were for swimming! After twisting open the jump rings, you’ll attach the charms or beads to the jump ring, then attach them to the link of the chain, and close the jump rings. I attached the beads and charms randomly to the chain on every other link. I left the middle link open for the flattened bottle cap. 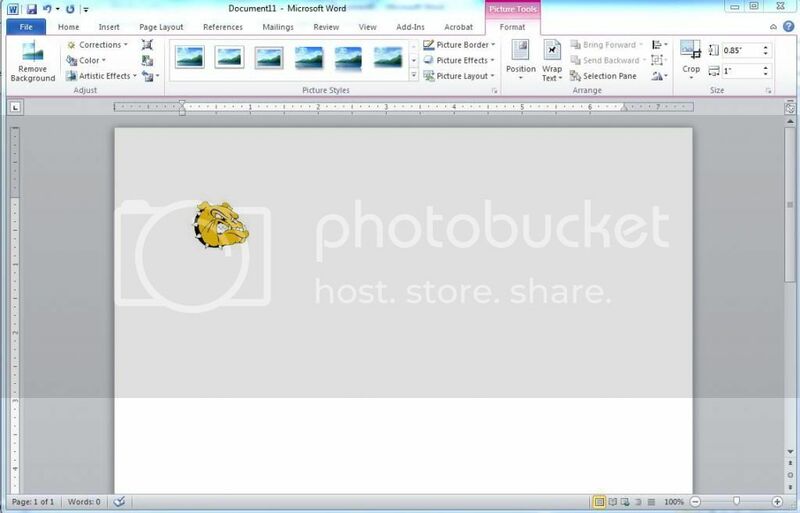 I then printed out the image using my color printer on cardstock and used my 1″ punch to create a circle that fits into the flattened bottlecap. I then used a tiny bit of E3000 to attach the image to the bottlecap, and covered the image with a 1″ Epoxy sticker. I then attached the flattened bottlecap to the open spot on the center of my chain! Tada! 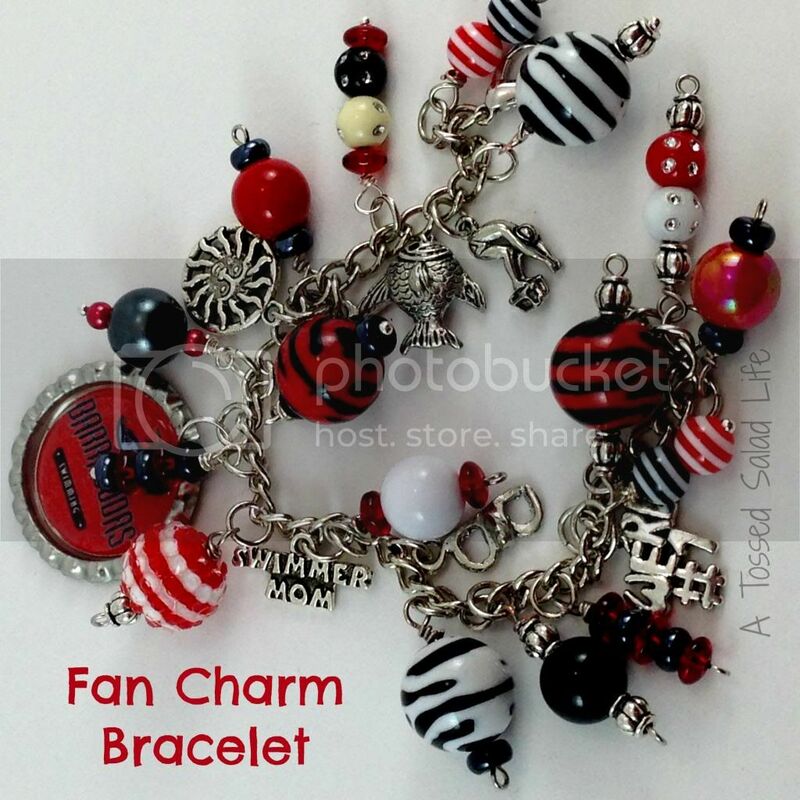 You have a personalized Fan Charm Bracelet. Want to make it even more fun? Add your child’s initial or team number for an even more personal touch! I love the way it turned out. Frog is very proud of my team spirit, and even Monkey loves it! The baby loves playing with the beads and baubles while watching his brother swim! How beautiful! A perfect craft to do with my teen daughters. Thanks for sharing at Inspire Us Thursday at Organized 31.